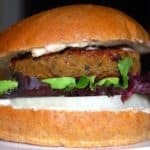 A smoky veggie burger made with quinoa and beans with kale, sage, and garlic. A gluten-free, soy-free, nut-free, vegan burger that works great on the grill. To cook the quinoa, rinse under cold water and then place in a saucepan with 2 cups of water and garam masala. Add salt to taste. Bring the mixture to a boil, reduce heat to medium-low, and let the quinoa cook until it has absorbed most of the water. Place a tight-fitting lid on the saucepan and continue to cook on low heat for 15 minutes. Turn off heat and set aside. To cook the beans, it is always better to soak them overnight but you can get away with no soaking if you have a pressure cooker. If you do, just follow your manufacturer’s instructions to get beans that are squishable but not falling apart. Otherwise, place the soaked beans in a large saucepan, cover with at least an inch of water, bring to a boil, lower the heat to medium-low and cook for about an hour until tender. Add the carrot, onion, kale, sage, and garlic. Add the tamari, mustard, coriander and cumin powders and the cayenne. Saute on medium-high heat about 5-8 minutes or until the mixture is dry and doesn’t taste raw anymore. Stir in the tomato paste and saute for 2-3 minutes. Add the ground black pepper and cooked beans and mix well. Using a potato masher, squish some of the beans. You don’t want this mixture to be too smooth– your burger will benefit from some texture.Add the chickpea flour and stir for another couple of minutes. You want the bean mixture to be quite dry and without any visible moisture, or your patties won’t hold together.Add the quinoa and mix well. Check for seasoning and add more salt and pepper if needed.